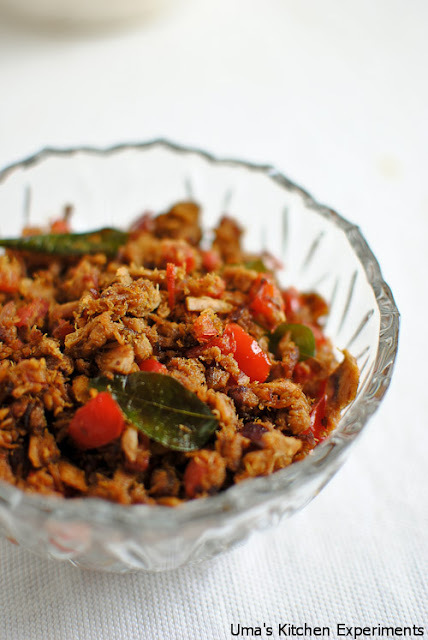 Canned tuna fish stir fry is the very simplest recipe anyone can make it. As it is coming in handy tins, it doesn't require cleaning and cutting. It is also high in vitamin D and omega-3 fatty acids. Canned tuna is available in brine(salt water), spring water and oil. I am yet to try Tuna in spring water. The recipe blogged here is very simple, quick, tasty, stomach filling and healthy tuna stir fry. 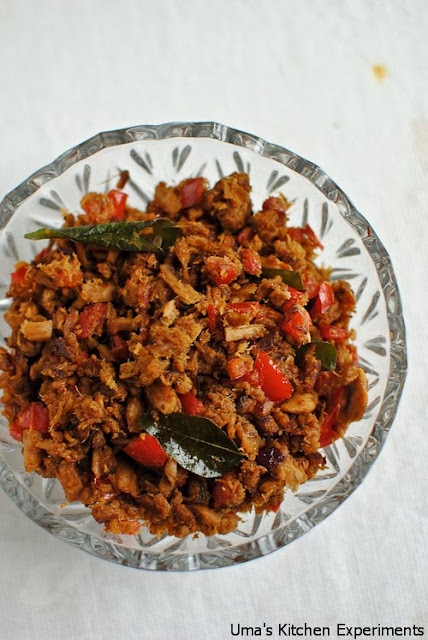 The combo of Plain Dal, Rasam and Tuna fish fry become success among my family members and I have started repeating this combo nowadays :-). 1) Drain the water from tuna cans and keep them aside. 2) In a frying pan, Heat oil. 3) When it is hot, add mustard seeds and urid dal. Allow them to splutter. 4) Add curry leaves followed by onion. 5) Saute onions till they are translucent. 6) Add capsicum and stir fry till it cooks well. 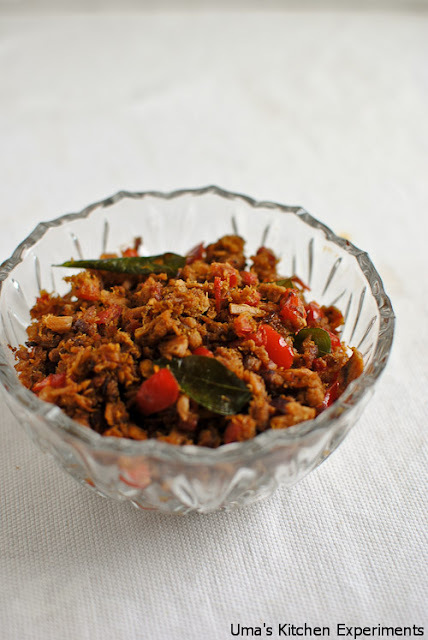 7) Add drained tuna fish, red chilli powder, turmeric powder and salt to the pan. 8) Crumble using your ladle so that tuna fish and spices mix properly. 9) Stir fry till the tuna fish cooks well. 10) Serve it hot with rice.